One aspect of the event that caught our monocled eye is the “Hands On Steampunk Brewing Experience,” presented by Industry City-based craft brewing manufacturer Alpha Dominche. Steampunk brewing? It’s enough to make our imagination run Wild Wild West with visions of a machine that resembles Dr. Loveless’s steam-powered mechanical spider, spitting out slow-roast instead of fire. But, not so fast. Yes, Alpha Dominche’s logo is a coffee mug with a clock gear instead of regular handle. And yes, it’s likely that the barista who serves you your Steampunk coffee or tea will be mustachioed. 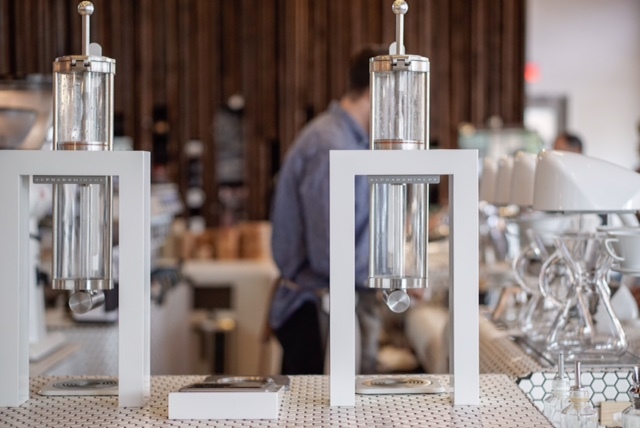 However, their sales operations manager Tarra Culbertson told us that the name of the machine is more about the fact that “no other commercial brewers for filter coffee or tea use steam to brew it,” and less about having a sci-fi subculture aesthetic. It’s still pretty cool, though (we GUESS). 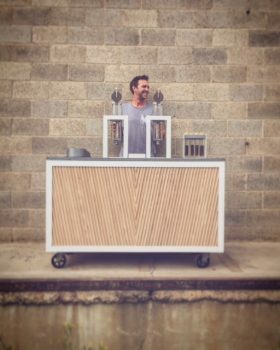 The aesthetically modern set-up of the MOD2 model they’ll be allowing CoffeeCon attendees to test includes an under-the-counter boiler, two see-through counter-top brewing chambers mounted on arches, and an Android tablet. The tablet has a proprietary app that saves and shares coffee and tea recipe parameters (water temperature, water volume, total brew time, level of agitation…) so that baristas “can start the brew and go do whatever else, but they’ll know that that coffee is going to be the same cup, every time,” Culbertson said. It was invented in the backspace of a coffee shop in Montana where she worked for the founder as a barista during college, along with the now-principal designer. If nothing else, the hands-on Steampunk testing sessions may be your only opportunity to operate a $13,000 machine this weekend. ($13,000!!!) And if you can’t make it, you can always sample a Steampunk coffee or tea at either Kaffe 1668 or Nobletree Coffee. And if you still just want to see a gadgety lowercase “s” steampunk coffee machine, don’t worry, the internet provides. CoffeeCon will take place Saturday, June 4 from 9:00 am to 4:00 pm at Industry City, located at 233 37th Street. Tickets can be purchased here.